A mix of short fiction and memoir, Let Me Tell A Story is quite a departure from the military crime novels Betit has published in the past. 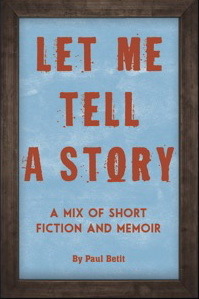 Let Me Tell A Story is a collection of first-person stories that take place over a 60-year period. The book starts with a tale about a 12-year-old boy who learns some important life lessons during a family trip to Aroostook County. It ends with a piece about an elderly Maine couple learning some lessons of their own while coming to grips with old age. In between, readers meet old soldiers and young soldiers, brothers and sisters, mothers and fathers, disc jockeys and drug dealers and other sordid types. Half of the ten stories in Let Me Tell A Story are set in Maine. A number of them were inspired by Betit’s experiences during the Vietnam War and its aftermath. There's an old Maine joke in which a tourist asks a Mainer "Have you lived here your whole life?" The old Mainer replies "Not yet!" This collection of stories gives one a feeling of the author's whole life, up 'til now anyway. Each story touches upon a milestone in his life. Through the stories we can "feel" what it has been like to grow to maturity in a life without abundance but still with significance. Experiencing wonder and curiosity, young love, bad decisions, achievement and aging. I will now put down my kindle and take a few moments to reflect upon my life. There are certainly some similarities. --Posted Nov. 23, 2018, on Amazon by Vintage Geek, who read Let Me Tell A Story on his Kindle.